What do Blackbird Review staff members do in the summer for fun? They write, of course, and, this summer, two staffers saw their hard work come to fruition by having that work published! BBR Editor-in-Chief Sara Gannon and BBR Fiction Editor Lindsey Odorizzi put their writing on the line and submitted work to two prominent magazines this July, and both had their work accepted. Lindsey’s story, “Ripping the Sky,” was published on the Teen Ink Magazine website (http://www.teenink.com/fiction/action_adventure/article/912715/Ripping-the-Sky/), and Sara’s poem, “Pragmatic Musings,” was published in the September 2016 issue of Chronogram Magazine (https://issuu.com/chronogram/docs/chronogram-0916). Sara and Lindsey’s previous work, along with work from other Voorheesville writers, can be found on the Blackbird Review website at http://blackbirdreview.org/. 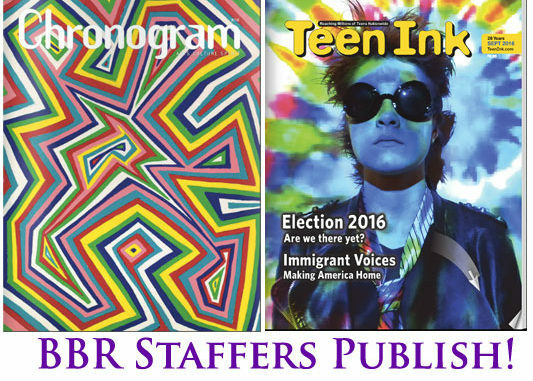 1 Comment on BBR Staffers Published! What wonderful achievements for the authors and a credit to the English Department at Voorheesville H. S. that cultivated such bright students.